All work and no play they say makes Jack a dull boy so after moving to and fro making sure Ghanaians enjoy a good standard of living, president Nana Addo Dankwa Akufo-Addo would have to listen to songs as a form of entertainment to release stress. The first gentleman of the Republic of Ghana at the recently held MUSIGA Grand Ball made patrons at the event know that he loves highlife. 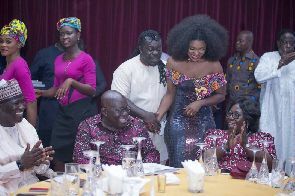 He mentioned names of legends he likes listening to their songs and they included legends like C.K, Man, Amakye Dede, Dadaddy Lumba, Paape Yankson, Gyedu Blay Ambulley and many others. The 2017 MUSIGA Presidential Grand Ball happened at the State Banquette Hall on December 29, 2017.